Are you looking for the right tool to ensure performance of your systems? Matching your specifications and budget, our Performance Testing specialists can provide advice on what tool is right for you, offering cost-effective licensing, implementation, execution and reporting as needed. Test and monitor your performance to ensure new builds can handle the necessary load and prepare for expected spikes in traffic. Our Performance Testing Specialists are skilled in a wide range of advanced toolsets. We also offer licensing in a number of toolsets, with some being available on-demand via the cloud. The Planit cloud allows for faster provisioning of performance testing tools and infrastructure using our flexible cloud platform. Planit can provide tools, infrastructure and consulting on-demand providing a cost effective way to gain confidence in your applications. With the Planit cloud, you can increase your load generators and licenses as you need them. No more paying for things you don’t need. Best of breed tools allow for the ultimate performance testing solution via our cloud portal. Pay only for your infrastructure with this rock solid open source performance testing tool great for smaller projects. Silk Performer is a proven, powerful and easy-to-use load and stress testing solution for optimising the performance of business applications. LoadRunner is the industry standard for application performance testing for enterprise level testing, analysis and reporting. IBM Rational Performance Tester is a performance testing solution that validates the scalability of web and server applications. Save yourself from the complexity and expense of provisioning your own performance testing infrastructure. 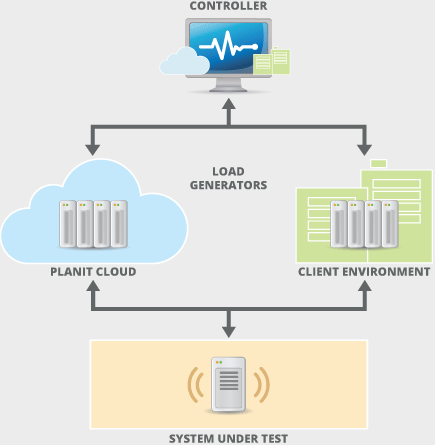 Leverage Planit’s fully hosted performance testing solution including licenses, controllers and load generators. Planit can integrate our cloud offering with your current testing solution. Need additional injectors or virtual users? The Planit Cloud can be used to boost your current infrastructure and licenses as you need them. The Planit Cloud can be used to simulate load from both remote and local locations around the globe.